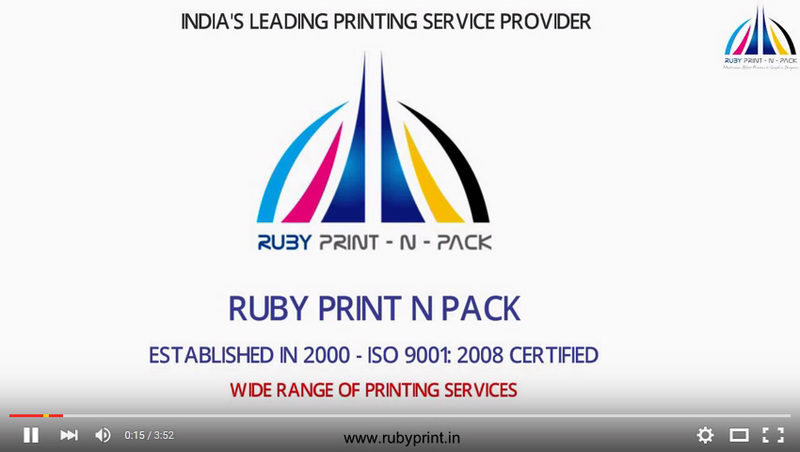 What we do at Ruby Print N Pack? We are a one-stop solution for all printing needs such as business cards, invites, posters, brochures, stickers, flyers, newsletters, manuals, magazines, letterheads, envelopes, head rest covers, etc. How is the designing of a product as per customer requirement done? We provide highly creative design ideas for your brochure, corporate logo, business visiting cards, corporate stationery, banners, catalogues, newsletters, magazines, booklets and manuals. Our use of latest softwares ensures to get the best in design needs. How easy is the mode of payment for your clients? The mode of payment with us is simple and secure. Once the project cost is approved, the client can make payment through online payment gateways by mentioning their Quotation No. during the time of payment. Various payment gateways such as CC Avenue / Pay U Money are available for your easy transaction. Clients can make payment through their VISA / MasterCard Debit / Credit Cards also. Various Net Banking options are also available. What is your after sales-service like? Our relationship doesn't end after your needs have been dispatched. We are committed to timely delivery of best quality products to our clients. For this, we have a regular dialogue with the clients and address any problems of quality, shipping, etc. on priority. The cost of delivery is largely dependent on the method of shipping chosen by you. Normally, once an order placed cannot be changed or cancelled; since it is made specially for you. Can You directly transfer to our Bank Account?